Rubber Room Ramblings: AWESOME FREE STAMP SET FOR HOSTESSES! I love the font on this stamp set, and there are so many wonderful words in it and it's FREE! I was able to earn this stamp set in July through a promotion for Stampin' Up! Demonstrators, and I love it! This stamp set is called Good Greetings. 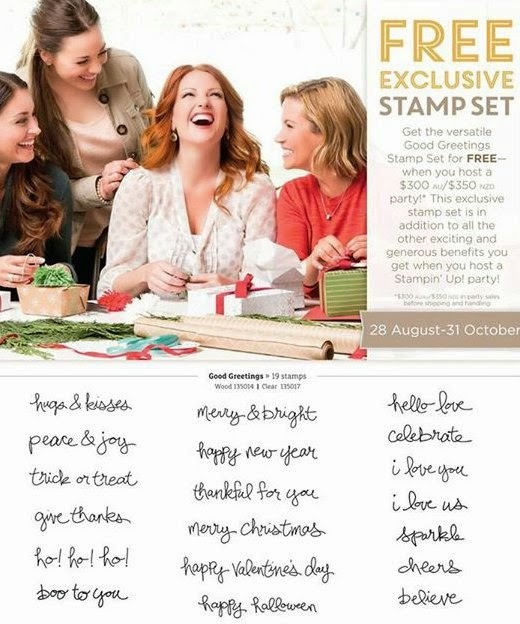 From now until October 31st, when you hostess a workshop with a minimum of $300 in sales, you will receive this stamp set absolutely FREE! I have several hostess dates available, so contact me to schedule your workshop today!